The Hotel & staff were amazing. We could have done with firmer pillows, but apart from that couldn’t fault the hotel. Shopping and Mumma Mia A group of 8 beautiful friends have just had 3 nights at The Mantra, we loved everything, the position, the staff, the pillows, the bed. The staff were wonderful nothing was a problem, early check in and late checkout. We will definitely stay again, a great time was had by all. Basic, clean, friendly, simple and cheap. A hassle free and pleasing stay. 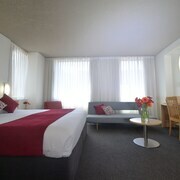 Room was lovely and comfortable. small but functional kitchen. Great spot, great price! Very good little hotel in a great spot for anything at the Princess Theatre - close to bars and cafes. Been struck down with a bad case FOMO? Spoil yourself with a break in Chinatown. 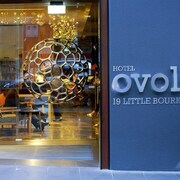 Situated 0.8 kilometres from the centre of Melbourne, it's one the best places to stay while exploring Victoria's capital. Start making epic memories (and taking some brag-worthy selfies) at the Crown Casino and Entertainment Complex, Federation Square and St. Kilda Beach, just some of Melbourne's most spectacular sights. The Melbourne Museum and the National Gallery of Victoria are not too far from the centre of Chinatown. These top tourist attractions really ought to be on your agenda. Too exhausted to travel miles away? 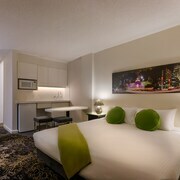 On the lookout for a hotel near the Crown Casino and Entertainment Complex? Easy. 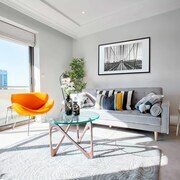 Check out the AKOM Docklands, Crown Towers, Park Hyatt Melbourne, Grand Hyatt Melbourne and Docklands Private Collection of Apartments - NewQuay. If you want to stay nearby after visiting the Melbourne Museum, the Clarion Suites Gateway, Crown Metropol, Mantra Southbank Melbourne, Melbourne Short Stay Apartments MP Deluxe and Tribeca Serviced Apartments Melbourne are all comfortable choices. Margaret Court Arena plays host to outstanding entertainment and events throughout the year. 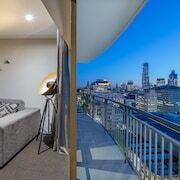 If you're searching for nearby hotels, the Caroline Serviced Apartments South Yarra and Art Series - The Cullen are a couple of tempting choices. Check the schedule at Sidney Myer Music Bowl for upcoming concerts. You can throw down your suitcase and catch some Zs at the Somerset On Elizabeth, Melbourne and Quest East Melbourne if you want to stay close to this sight. You certainly don't need soft, fluffy bathrobes, an enticing room service menu and 1000 thread count sheets all of the time (but, it's nice sometimes, right?). 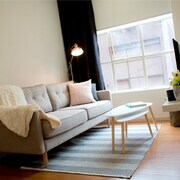 The more upmarket options here are the Swanston Hotel Melbourne Grand Mercure and Rydges Melbourne Hotel. Just been jolted awake by the alarm? Ready for a full day out with the squad but dying for a caffeine hit before you set out? Don't fret. You'll be able to grab a strong coffee to go (and maybe a cheeky treat as well) nearby at Cafe Simply T. Trust us, you'll need something substantial to pig out on after all that sightseeing. Luckily, Shark Fin House has a delicious menu which will really fill you up! If all that grub has made you a bit thirsty, Fad Gallery is just a hop, skip and a jump away. It's an awesome place to grab a stool and chat with the locals! Don't panic if you can't locate the best Chinatown hotel room. 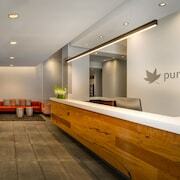 You'll find more places to get a great night's sleep nearby. East End Theatre District is about 0.2 kilometres from Chinatown, and Melbourne Central Business District is approximately 0.6 kilometres away. Nothing beats the feeling of stepping off the plane into a new and exotic place. Hotels, flights, experiences, rental cars — whatever you want, we'll make it happen!